While Non-Stop had an interesting premise, I felt there were too many plot twists that all had to happen in a particular sequence in order for the story to work. 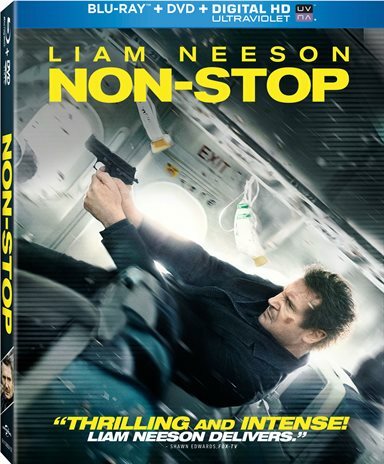 Liam Neeson (Taken, A Million Ways To Die In The West) plays Federal air Marshal William Marks in the Blu-ray release of Non-Stop, an action thriller that will keep you guessing for most of the hour and forty five minute running time. While the film feeds into our fears in a post 9/11 world, for Agent Marks, it's just another day at the office, 40,000 in the air, until he starts receiving cryptic text messages. Apparently, aboard the transatlantic flight to London is a terrorist who is threatening to kill someone every twenty minutes unless $150 million dollars is deposited into an account. It's Marks' job to try and figure out who the assassin is before he or she kills everyone on board. The terrorist lays out an elaborate plot using social media that evolves into a murder mystery where Marks is pointing fingers at anyone and everyone including the co-pilot and the other federal air marshal aboard. Sadly, the second marshal, Jack Hammond played by Anson Mount (Safe), is the first one to be killed leaving only one Marshal, Marks, aboard the plane. Since the terrorist sets the hijacking up to frame Marks and make him look like the hijacker, it's rather convenient the other Marshal is dead. Although, I'm not sure "convenient" is really the right word since, as you will come to find out, everything the terrorist does is carefully calculated. Supporting Marks is a seemingly innocent passenger, Jen Summers played by Julianne Moore ( Crazy, Stupid Love), who has a secret of her own and Flight attendant, Nancy (Michelle Dockery – Downton Abbey), who has known Marks for a long time and tries her best to trust him even in the face of ever mounting evidence against him. Rounding out the cast are Scoot McNairy (Argo) as the timid school teacher visiting family in London, Corey Stoll (Salt) as the NYPD officer who recruits other passengers to subdue Marks, Nate Parker (Red Tails) as the tech guy heading to London for a job interview and Omar Metwally (The Twilight Saga: Breaking Dawn – Part 2) as the stereotypical Middle Easterner aboard the doomed flight. Directed by Jaume Collet-Serra (Unknown), Non-Stop is aptly named as the action and drama doesn't stop for close to two hours. Collet-Serra also directed another Neesom Film, Unknown, and the two discussed how well they seem to work together in the Blu-Ray Extras. The Suspense at 40,000 feet featurette takes an in depth look as to how the cast and crew managed to work and film in such a confined space for approximately two months and gave some interesting insight into how Collet-Serra managed to pull off interesting camera angles on such a small, crowded set. The second featurette, Non-Stop action, showed how they coordinated the fight scenes while being mindful that they were in a small space, especially one fight which took place in the airplane bathroom. Shot in 35mm the beautifully crafted shots shine though with a crisp, clear picture in 1080p AVC. The only complaint about video quality is during the BD-LIVE trailers that are downloaded when the Blu-ray starts. They are extremely pixilated and actually detract from the enjoyment of the film. The DTS Audio Master only helps envelope the audience in the confine of the plane to make the suspense even more realistic. While Non-Stop had an interesting premise, I felt there were too many plot twists that all had to happen in a particular sequence in order for the story to work but that realistically probably wouldn't quite happen in real life. The screenwriter and director made you second guess every passenger and airline employee, which I found added to the suspense and story line. Neeson does what he does best playing a gruff, rough around the edges guy, who has seen some hardship in his life and Moore gives a solid performance. Particularly noteworthy for me were members of the supporting cast including Michelle Dockery and Omar Metwally. The action scenes were pretty much what you would expect from this kind of movie with a few interesting moves which made Marks seem like a Ninja warrior. Download Non-Stop from the iTunes Store in Digial HD. For more information about Non-Stop visit the FlickDirect Movie Database.